Twenty-five years ago, Cambodia was a country emerging from one of the worst genocides' of the 20th century. A country carpet-bombed by the Nixon admistration during the Vietnam war and still after all that suffering a civil war until 1999. Once known as the rice-bowl of Southeast Asia, Cambodia had been a small, prosperous country with a beautiful cultural heritage. Auguste Rodin witnessing the Cambodian Royal Ballet in the early 1900's said that "Only the Khmers (Cambodians) have learned movements that nobody else has even imagined existed." In ancient times, Cambodia was greatly influenced by India both in the use of the Sanskrit alphabet but also with Hinduism, later Cambodia was to become a Buddhist country and the extraordinary Temples of Angkor were built under an expanding kingdom which was to encompass neighbouring Thailand, Laos and Burma. The result of this was a wonderful cultural heritage of music, dance, theatre, poems and sculptures. Music was used by Cambodian people to express every phase of life, from the cradle to the grave and their culture was an integral part of their society. Then all was nearly lost in an annhilation of everything to do with art, both ancient and modern, together with skills and learning, doctors and engineers, hospitals, banks, schools, Buddhist temples, infrastructure. Why? Because the Khmer Rouge, an obscure Maoist group led by Pol Pot began, even before 1975, to eradicate all traces of the past, by exterminating artists and educated people. By the end of their regime in 1979, nearly a third of the population had died and ninetry-percent of artists had been killed. The Khmer Rouge then went on to fight a war of attrition from their mountain and jungle bases for another twenty-years. In 1991 after having visited Cambodia to compile a report on the violation of human rights by the Khmer Rouge, I was asked by the Dean of the Music Faculty at the University of Fine Arts, to return and help teach violin, because so many teachers had died. Graduating from the Royal Academy of Music in London I returned in 1991 to work as a teacher (volunteer) at the university and try and help restore the Western music department together with other teachers. 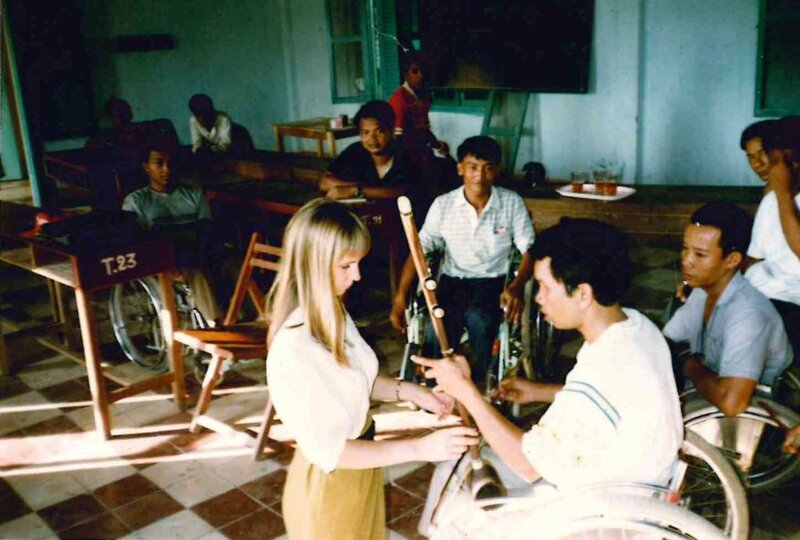 At the same time I learned traditional Cambodian music and began teaching as a volunteer, disabled war veterans in a rehabilitation centre, together with other Cambodian teachers. The effect that music had on these men was extraordinary, some had suffered from depression, anger and suicidal tendencies and when learning music, they began smiling and laughing. I learned the power of music as healing therapy and as a tool to communicate. Music can describe emotions which cannot be expressed in words. It wasn't long before I awoke to the fact that the Traditional Music Department was in danger of dying out. Those masters who were still alive were struggling to teach students who just weren't interested or who were too poor to come to lessons. The tradition of music dating back a thousand years, was about to disappear. So with funding from the British Embassy I set up a scholarship scheme based on attendance for traditional music students. The project in itself was successful because the students attended regularly and developed a love and respect for their art. However I could go no further in helping the university and the music department and this was my failure number one. From my failure number one, I learned that one can only go so far in an existing program. To make real changes, one has to start from the beginning with everyone holding the same work ethics and sharing the same dream. 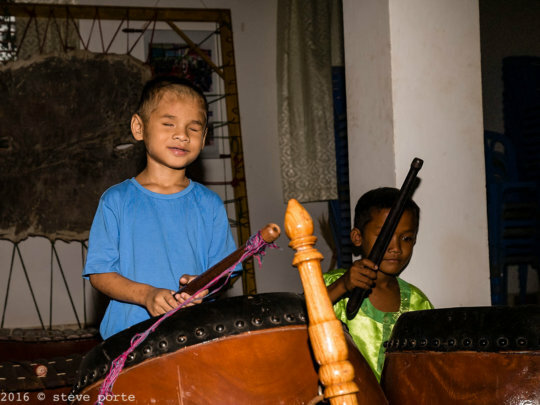 From lesson number one and from my experiences at the rehabilitation centre and with old music masters, I decided to start my own music school and really make a proper attempt at saving traditional Cambodian music. At the time I lived on the outskirts of the capital Phnom Penh in a room in a wooden house on stilts in a village. The house belonged to a Cambodian woman who also rented the lower part of the house to twelve Vietnamese families who lived in dire poverty, their living quarters consisted of one room per family divided from the others by rush matting. There was no electirity and no running water and I would fetch water from the well and carry it up the ladder to fill the water jar in the communal wash-room. Living in this way gave me profound insight into the conditions of ordinary people and before long each morning at dawn, there was a queue of parents and their children wanting cuts and wounds to be disinfected, because I was the only person in the village with disinfectant and cotton wool. In those days very poor children suffered incredibily in every way. My question was, if they who had parents were suffering so much, what happened to those without any parents at all and what happened to those who had a disability? 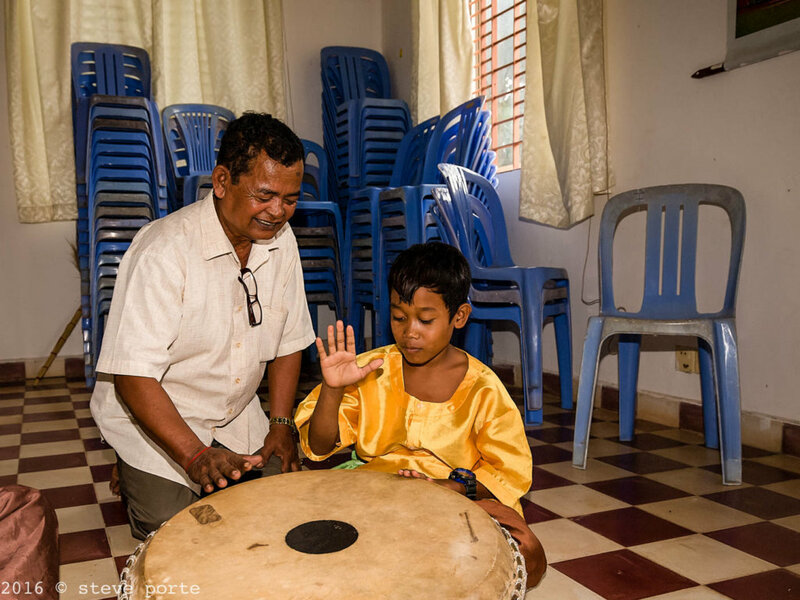 I then understood that building a music school would not be enough and that children who were most vulnerable either through the loss of their parents or through a disability would need proper care and scholastic education, as well as arts training. In 1992 in the North-West and South-West of Cambodia, the Khmer Rouge were very aggressive and the civilian population suffered many casulties. One of the small towns most affected by Khmer Rouge guerrillas, was Kampot in South-Western Cambodia. Once an important river-town also near the sea and with important heritage sites, it had been devastated during Khmer Rouge rule and the ensuing civil war. The Khmer Rouge had their stronghold in the nearby mountain of Phnom Vor and they regularly attacked villages for miles around. That is where I decided to build our school, because there were almost no aid agencies and to be exact there were only five foreigners in the whole Province. It was a place almost forgotten by NGO's, difficult to get to and with a population literally abandoned to their fate. So began the long uphill battle to build our school. At that time I was aged twenty and did not know how to drive a car! So I was kindly loaned a car and driver by a British business company to get to Kampot. Although only 137km from the capital Phnom Penh, the roads and bridges were so broken that it took over four hours. On arrival in Kampot I went to see the Deparmtent of Culture and other relevent authorities. They took me to see two pieces of land, one outside the town on the road towards the sea and the other in the center of the town. I chose the latter because of concerns over lack of electricity, water and security issues with the Khmer Rouge. I was then taken for an audience with the Governor of Kampot and told him in Khmer (Cambodian language) what I would like to do. He asked me to sing a Cambodian song which I did and then he said that I could have that piece of land for free. Thanking him very much I asked him to sign a piece of paper in order to show the Ministry of Culture in Phnom Penh. In 1993 I founded the Khmer Cultural Development Institute, a Cambodian NGO which was ratified by the Supreme National Council. From there I began fundraising to build our school - construct three buildings, as well as a water tank and longer-term funding for childcare support and arts and academic tuition at our school. It took me over two years to find enough funding. The first challenge was the lack of interest by International NGOs of the value of music therapy and the recognition of the revival of traditional Cambodian culture after the genocide. In those days the arts were seen as a "Waste of time" by the International community. I went from donor to donor and wrote over a hundred letters, but there was no positive result. I failed for a very long time to bridge that gap of understanding. I had to take a step back and see it from another view point. How do others see art and music and how can I transmit my knowledge and passion for music and help people see from my perspective? So then the format of my written proposals and my dialogue with potential donors changed and I began to communicate to others in a different way and share with them my vision and passion. 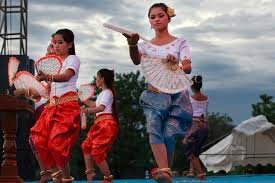 In later years UNESCO would declare tradititional Cambodian music, dance and theatre as World Intangible Cultural Heritage. Our school then won the UNESCO World Decade for Cultural Development in 1995. Today of course music and the arts is now considered an essential part of therapy and one would not immagine the resistance there was to this kind of training over twenty years ago. Another factor was my age and being a woman. Being so young did not help infuse donors with confidence, they were afraid I might not be capable of pulling through the project, seeing it the end or dealing sensibly with funds. I also got into scrapes where male ambassadors and male businessmen misinterpreted my enthusiasm and thought it an invitation to make inappropriate remarks or gestures. That was another failure to be taken seriously as a young woman, but perhaps this time not my failure but theirs. What I learned from that collective failure, was to put my long hair up in a bun, dress very soberly, never take late afternoon or evening meeting appointments and be very serious, calm and determined. Believe in yourself and people will believe in you. For a long time I shunted forth between the British Embassy, the Canada Fund and the Embassy of Japan, because each Embassy had shown interest in sponsoring one of the buildings, but nobody wanted to be the first and each was waiting for the other to commit themselves. At some point the British Embassy made a positive decision and then the others followed suit. In the midst of fundraising, personal tragedy came, as three members of my family died back in the UK in a short space of time, I was to lose two more two years later. The British Ambassador began to understand that age was not always a factor, but inner-strength and vision was. 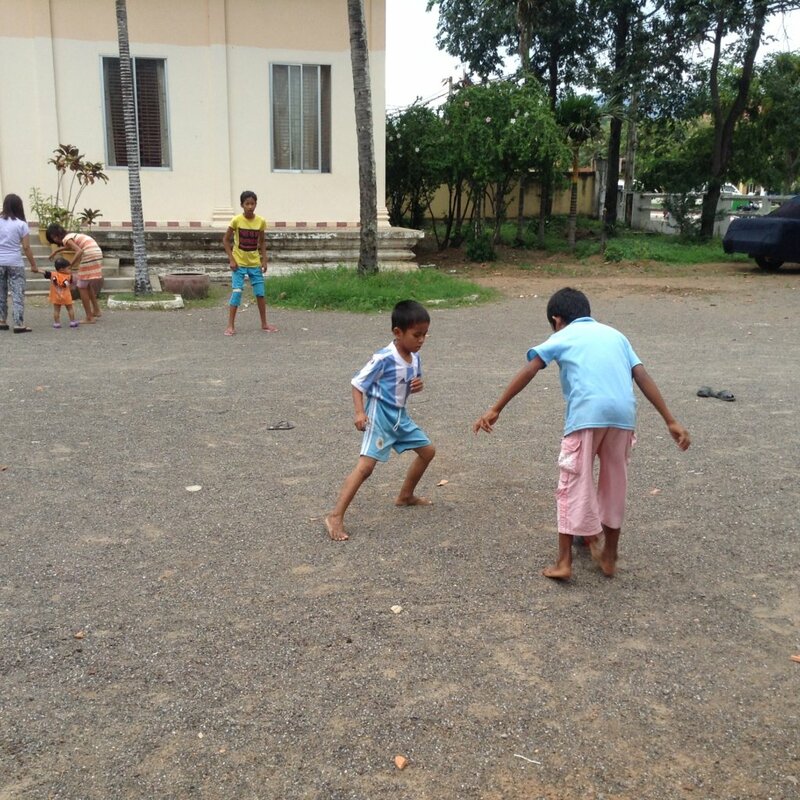 The next challenge was the utter wildness of Kampot, a place without proper law and order. Some in authority were doing logging business with the Khmer Rouge, others were corrupt and police and soldiers regularly shot each other in the settling of accounts. Once funding arrived, building our school was fraught with difficulties. There was a 3pm curfew because the Khmer Rouge controlled the main highway to Phnom Penh, fighting and shelling went on between government forces and the Khmer Rouge near Phnom Vor after the Khmer Rouge had kidnapped three Westerners, who were then tragically executed. Then local officials from the Department of Culture and other departments wanted me to give them pay-offs. All they saw was money. They did not see the school as something positive for their community, they just thought I ought to give them something. I refused categorically and began receiving death-threats and kidnap threats. I failed to see that their experiences after the genocide and the war had led them to think differently from myself and I kept expecting correct behaviour from them, so the situation remained the same. I learned from this failure, that sometimes we have to take strong action and so I went to the Ministry of Interior and informed the vice-Minister of what was going on. The Ministry of Interior is a powerful entity and their officials told those corrupt officials in Kampot to leave me alone. Things got substantially (although for a long time never completely better,) but much easier to finish the task of building our school! On August 24th 1994 our school was completed and our first children came to stay with us. The selection of children in need had been done with district authorities, village chiefs and trusted, qualified Cambodian colleagues. One of the last great masters of Pin Peat music came to teach at our school and today his former student Uon Sambo who graduated in the year 2000 and went to University before working as a musician at the Royal Palace, is today our Pin Peat teacher. 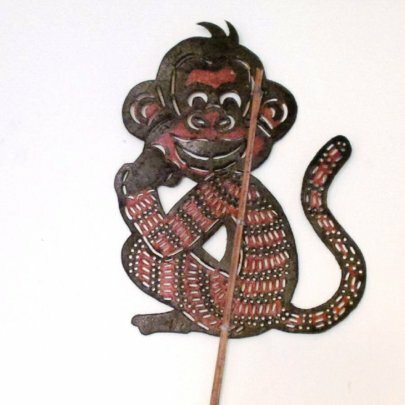 Our school has grown to teach not only Pin Peat music, but Mohori music, classical Cambodian ballet, folk dance, rare Yike theatre and we have revived the art of shadow puppet theatre once lost to Kampot. 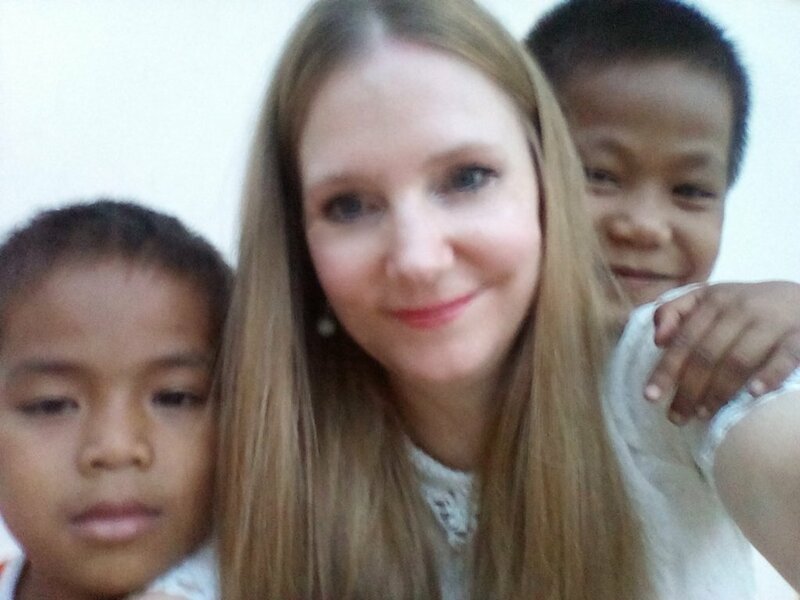 All our staff are Cambodian and our board of directors are voluntary experts who give their time, skill and good-will to help us. Some of our staff have been together since 1994! Over two generations of children have passed through our school and we now have over sixty-five grandchildren born from those who lived and studied with us. Today we care for orphaned children, some affected with HIV and epilepsy, we also care for the blind and we are currently the only centre in Kampot to give education and rehabilitation to blind children. We also give free arts training to very poor children from local villages as vocational training. Somnang Goes to Phnom Penh! Thank you all for your generous and swift response to our urgent appeal for Somnang's medical care in Phnom Penh. You have all been wonderful and helped us reach our goal very quickly! On the 1st September Somnang was taken by his housemother Thiyeu to the Kunthea Bopha Paediatric Hospital in Phnom Penh. The visit itself was free, but we had to travel 137km to Phnom Penh and Somnang stayed overnight in hospital. The doctors visited his ears and checked his general health before deciding what medical treatment to give him. He was allowed home back to our school and prescribed three different medical therapies with the reccomendation that he be brought back to hospital immediately should his condition get worse or the medicine have adverse affects. To date, the pus in Somnang's ears has retreated and is almost entirely gone and his reaction to his treatment has been very positive. He is due shortly for his general HIV check-up and we will see the outcome. His general state regarding HIV is now much better and he no longer has fever or digestive problems and his skin is less prone to itchy rashes and blisters. Checks also show his lymph-nodes to be in good form. We are incredibly grateful that our little boy is doing so well. He used to have understandably difficult moments just after the death of his mother where he got very angry and upset, but our housemother and staff have been so good, just gently waiting for these moments to pass. Now he is in a better place both emotionally and physically and he has lots of friends, loves football, drawing and his schoolwork, as well as dancing and music. 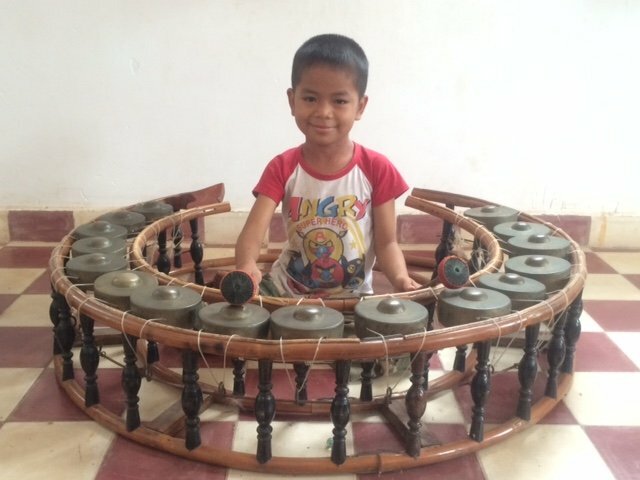 We are happy to share this photo of Somnang at the Gong Vong Thom instrument - Pin Peat music. * For reasons of privacy, Somnang is not his real name. If you go into rural areas in Kampot, away from the main road, you will find many people still without electricity and running water. None of the water whether in the city or the countryside is drinkable without being boiled. Children often go to school barefoot and sometimes miss lessons to work in the fields and assist their families. Due to lack of government policy regarding the past and the Khmer Rouge genocide (1975-79), there has been no form of truth and reconciliation. An entire country has been left to overcome enormous traumas while their former perpertrators go free. The result is not suprisingly a mess. Many older generations suffer from PTSD and have affectivity, gambling and alcohol problems and issues with violence. The younger generation of Cambodians has felt the effect and too many middle class youth have drug, gangs and glue-sniffing problems. There is also an ever widening divide between the rural poor and the wealthy ruling class, with ordinary people dispossessed of their land, forests decimated and people's livlihoods along with it. Many people in rural areas are desperate to create a better life for themselves and their children and some leave their children behind with elderly relatives and head for Thailand to work there, sometimes never to return. Outside Kampot town, there lies a village called Phum O' Toch, where there are children who struggle to get by day to day, because some of their parents are not only poor, but have alcohol and gambling addictions. They would very much like to come and study at our school. Our Pin Peat teacher lives nearby and discovered that many of them are naturally very talented artists. 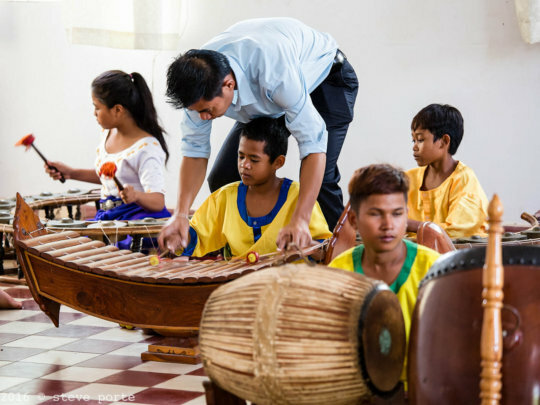 For them coming to our school would mean receiving serious vocational training, shaping their futures as professional artists in traditional Cambodian music, dance and shadow puppetry. However many of them are too poor to own a bicycle and are fearful of coming home from classes at our school by themselves in the evening on the main road from Kampot. They would like to come and study at our school if we can provide them with group transport. Coming to our school also means receiving a hot meal, medical care and help for the poorest and most vulnerable of the children, making a big difference in their lives. Please visit our micro-project to support their transport costs for this year. Rithy* is eleven and has been a scholarship pupil and would really like to continue his studies. He is a very talented Pin Peat music student and last year performed at the first International Writers and Readers Festival as well as several other official events. He used to come and eat at our school and sleep there too, when things got too rough at home. Sometimes he didn't know when his next meal was coming, because his parents were out gambling. He loved coming to our school. However financial support for our programs has dwindled and because our school could not provide transport any more, Rithy could not come. We would really like to continue supporting and teaching Rithy and all those children from Phum O' Toch who dream about coming to our school. Thank you for all the support you have given and your kindness and generosity through all this time. Please spread the word about this project to make it possible for our village children to have free lessons at our school too and create a real future for themselves. *To protect his privacy, Rithy is not his real name.